My interest was piqued. Two coffee-drinkers at Starbucks spoke loudly enough for me to be an unintended, yet all too willing listener. One man was recruiting the other. It would have otherwise been a no-brainer to tune them out, but then I heard the words, ‘the Agency.’ Those of us that live in proximity to the Beltway understand what this is. We live in the ‘If I told you I’d have to kill you’ Intelligence Community where you need clearance to enter buildings and a disciplined tongue in all casual conversations. The Agency. Security and Pentagon and President stuff! THE AGENCY!!!!! I pastor a church filled with people in the Intelligence Community. When it comes to what exactly they do, I don’t ask and they don’t tell. Because then they’d have to kill me. And they would be without a pastor. Well… and I would be dead too – bad all the way around. So you can understand why my ears were burning. But then something happened. Something utterly unexpected was said that caused me to stop listening all together. No, I wasn’t discovered to be listening. Like I said, I’ve seen the movies and shows going all the way back to The Man From U.N.C.L.E. – I know how to do espionage (yikes! – one of those words!) and how to listen like a secret agent. 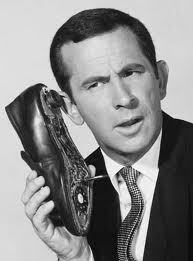 When I was a boy I turned my first generation Bic pen into a mini-walki-talkie, and yes, I’ve talked into my shoe. Trust me, I listened under the radar. An Insurance Agency with a central database! An agency with computers and cases! What a waste! How could these inconsiderate clods sit close enough to another patron and make such noise about such trivial things? The audacity! Or you, if you are His. It is an everlasting love (Jeremiah 31:3). His interest in us never depended on our ability to be interesting, good, exciting or pure. It is a never-give-up-on-the-prodigal (Luke 15), it-never-depended-on-you kind of love. In a world filled with conditions and short attention spans this is good news. What was the other thing it left me thinking? Well, you really had us going there for a while 🙂 When I worked for the Agency (1958-1966) – actually I was in the Navy’s branch of NSA, known as the Naval Security Group – we called it ‘The Puzzle Palace’ (puzzles refering to code breaking). I’m sure it’s way more sophisticated now, but it was actually quite thrilling and rewarding work – at least until the Vietnam War. We had the son of one of our congregation members that working as a contract firefighter in Iraq at Al Asad. There was a section of the airbase that did not connect with the rest of the vast base – nobody in/nobody out. Well, OK, only on VERY rare occasions. On one of those occasions he met a helicopter pilot from “THAT” side of the base and got up the courage to ask just what went on over there. He had already figured it was something classified. The answer was simple, “We take people who aren’t here places they don’t go to do things that never happened!” YIKES! ha ha ha ha!!!! You have me cracking up, Mike! I love your writing – entertaining, but meaningful. Thanks! You are currently reading Unconditional at unfinished1.